May Day does not get much attention in America, but our culture has deep mythological roots in this holiday going back to our European ancestors and even to the ancient Classical world. I’ll be devoting three posts to this mythology for this May Day. Today’s is about the Goddess who lies behind May Day; the others will be about the bonfires of May Day Eve and the mythology and rituals behind the Maypole. For simplicity, in these posts I’ll employ the months and days of our current calendar rather than the original months and days of old local calendars. The first of these goddesses of spring holidays was the Hilaria festival (from Greek hilareia/hilaria (“rejoicing”) and Latin hilaris (“cheerful”), held between the vernal equinox and April 1. It goes back to when the Phrygian goddess Cybele was introduced to Rome, at the end of the 3rd century BCE. In her myth, she had a son-lover, Attis, a dying-and-rising god who was mortally gored by a boar. Cybele knew that he had not died for eternity but that his spirit simply had taken refuge in a tree for the winter, and that he would be reborn from the tree in the spring, on the vernal equinox. When Cybele was introduced in Rome, she was given her temple of Magna Mater on the Palatine hill and a also a holiday with corresponding rituals. In her festival, a pine tree (that of Attis) was cut and stripped of its branches, wrapped in linen like a mummy, and decorated with violets (Cybele’s flower, because in the myth violets were said to have sprung from the blood of Attis). It was then brought before Cybele’s temple on wagons in what resembled a funeral cortege, since Attis was “dead” inside the tree. This was followed by days of frenzied grief and mourning (including scourging) known as the “blood days,” when the tree was symbolically buried in a “tomb.” Attis then resurrected (rose out of the tree) on the day of Hilaria and was reunited with Cybele, symbolizing the beginning of spring. The tree was then erected before Cybele’s temple, and the people celebrated around it. The celebrations ended on April 1, which may be the origin of our April Fool’s day (the people were having a “hilarious” celebration). This has obvious parallels with the Maypole and May Day celebrations. The second of these holidays was the Floralia, named after Flora, goddess of flowers and spring. Originally she may have been a Sabine goddess, about whom we know nothing other than that she had a spring month named after her on the Sabine calendar (Flusalis, linguistically related to Floralia) and that supposedly an altar to her in Rome was established by the Sabine king Tatius during the legendary period of his joint rule of Rome with Romulus. But none of her Sabine mythology has survived. In Rome Flora acquired her entire surviving mythology from the Greek spring goddess Chloris (from chloros – “pale green”), who, as Ovid tells us, was originally a beautiful nymph in the Elysian Fields catering to the pleasures of the fortunate dead. There she also attracted the attention of Zephryos, the god of the West Wind and of spring, who quickly had his way with her. But then he married her, in what turned out to be a happy, loving marriage. As a wedding gift he filled her fields (her dowry in the marriage) with a flower garden, the flowers in which were said to spring from the wounds of Attis and Adonis. Zephyros, as the West Wind, brings the spring rains that grow the flowers. Thus, Virgil wrote that “the meadows ungirdle to Zephyros’s balmy breeze; the tender moisture avails for all.” Chloris also bore from Zephryos a son, Karpos, in Greek meaning “fruit” or “crop.” Through Zephyros’s wedding gift she became the goddess having jurisdiction over flowers, which she spread (by spreading their seeds) all over the earth, which until then was monochrome. She became goddess of spring. As Flora in Rome, in the late 3rd century BCE a festival was instituted in her honor that lasted from April 28 to May 2. It included theater, a sacrifice to Flora, a procession in which a statue of Flora was carried, as well as competitive events and other spectacles at the Circus Maximus. One of these involved releasing captured hares and goats (both noted for their fertility) into the Circus, and scattering beans, vetches, and lupins (all fertility symbols) into the crowd. The celebrants wore multi-colored clothing symbolizing flowers and spring, as later was customary on May Day in Europe. It was a time of generally licentious behavior. Flora also had a rose festival on May 23. 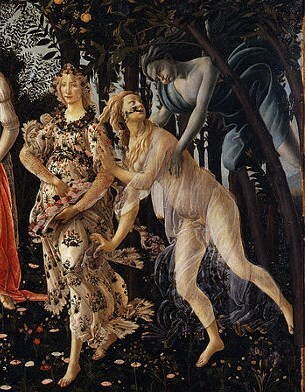 Flora’s myth is elegantly portrayed on part of Botticelli’s famous painting Primavera (“Spring”). As we view it, on our far right is Zephyros catching Chloris. To their left is Primavera (Flora), into whom the nymph Chloris had been transformed following her marriage. She is depicted in a multicolored flowery dress and as spreading flowers over the ground, as in her myth, a dress based on that of Aphrodite (Venus). According to Fragment 6 of the Greek epic Cypria, when Aphrodite emerged from the sea she was clothed in garments that the Graces and Horae made for her, which were dyed in the flowers of spring. One of the three Horae was Thallo (“the one who brings blossoms”), who in Rome became Flora. Detail from Botticelli’s Primavera, ca. 1482. The flowers coming out of Chloris’s mouth match those on Flora’s dress, strengthening their connection. The above goddess motifs appear in the May Day festivals in medieval and pre-modern northern continental Europe and the British Isles. In Scotland, there was a goddess of winter called Cailleach (meaning “hag” or “old woman”) or Beira, and correspondingly a summer goddess Brìgde. (They parallel the Slavic goddesses Vesna and Morena discussed in my April 3, 2015, blog post.) Each spring (or first day of summer, May 1) there was a festival marking Brìgde’s arrival. This annual spring transition of goddesses forms the background to the tradition of the May Queen. On May Day the May Queen and the Queen of Winter, together with their companies, would engage in a ritual contest, and the result was never in doubt. After the May Queen won, she would be crowned. In this crowning ritual the May Queen would be married to the May King in a ceremony that harks back to the annual reunion of Cybele and Attis. (In England this king was known as the “Green Man,” in Bavaria “Father May,” in southern Austria “Green George,” etc.) In the tradition of Flora, May Day festivities also involved picking flowers, making them into garlands, spreading the garlands and flowers throughout each village, and (as with the tree of Attis) decorating the May Pole with flowers (including violets). The goddess background to May Day also took on Christian trimmings. In Germany, on May Day Eve (April 30), called Hexennacht (”Witches Night”), witches were said to gather on the Brocken, the highest peak in the Harz Mountains, to foment their evil plans (after the advent of Christianity, they were said to meet with the Devil then), dramatized by Goethe in Faust. Their plans were then foiled through protective May Day rituals. Over time, that Eve became known instead as Walpurgis Night, named after the abbess St. Walpurga (ca. 710-778), who is said to have been instrumental in bringing Christianity to Germany in the 8th century. More importantly, in the 18th century if not before, May Day became an occasion for Catholics formally venerating the Virgin Mary, nearly as a goddess. Other aspects of May Day celebrations also had Goddess connections, which I will touch upon in my next posts about May Day bonfires and Maypoles. This entry was posted in Holidays and tagged April Fool's Day, Attis, Botticelli, Brigde, Cailleach, Chloris, Cybele, Elysian Fields, fertility, Flora, Foralia, goddess, Green Man, Hilaria, Karpos, May Day, May King, May Queen, Maypole, Morena, nymph, Ovid, Primavera, Queen of Winter, Roman Mythology, Sabines, St. Walpurga, Vesna, Virgil, Virgin Mary, Walpurgis Night, Zephyros. Bookmark the permalink. Thanks. If you ever have any questions, please don’t hesitate to ask.